The natural market reaction to any shortage is that prices rise. In this case, price is driver wages, which are again increasing significantly. Most fleets instituted large pay increases in the summer of 2014 with many repeating the increases again in 2015. Even with the soft freight environment in 2016, many fleets increased pay rates last year as well. Today, sign-on bonuses are used throughout the industry as competition for drivers heats up. Expect driver pay to continue rising as long as the driver shortage continues. Good benefits are also part of a total compensation package in the industry. As the report above addresses, each company has a different approach to distributing their benefits—some increase their mileage rates, others promise yearly bonuses or guaranteed weekly earnings. The way the companies distributed the information was as varied as the content itself. From pop-up windows to press releases, many of these announcements were front and center on company websites, grabbing the attention of potential new drivers and news agencies alike. May 2018 was a particularly busy month for industry increases, as both Schneider National and C.R. England announced investments in their driver pay rates, each taking effect by the end of the month. Schneider circulated the news via a series of press releases. A flashy graphic (“Again? Yep.” superimposed on an image of a wallet stuffed with hundred dollar bills) sits in the corner of the article announcing that, as a result of weekly driver pay evaluations, “Schneider is proud to announce a second round of significant team and solo driver pay increases in 2018” right “on the heels of a February pay increase.” The aforementioned February increase boosted van truckload rates by up to $.04 per mile. Additionally, teams have the opportunity to start $.56 per mile, while OTR drivers can start at $.52 per mile, and regional drivers can earn $.50 per mile. 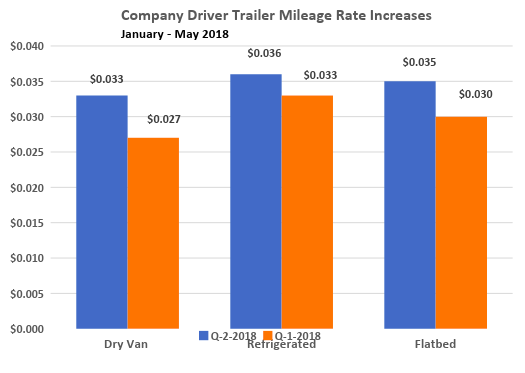 Although “pay increase amounts will vary by experience level and geography,” “all Van Truckload drivers of all experience levels have seen one or more market-based mileage rate base pay increases in the last year!” May pay increases continued to rise, averaging $.01-$.02 per mile. Team drivers also saw an increase in base pay ($.56 per mile to $.57 per mile). In the last 20 months, Schneider reports that their rates “have increased by as much as $.10 per mile” in response to market conditions. C.R. England’s May 25, 2018 press release is vague in its details, but introduces “multi-million dollar investment in our drivers” as a response to the “ever-changing and increasingly competitive marketplace” according to CEO Chad England. Chief Sales Officer Brandon Harrison reports that C.R. England’s drivers are “now among the highest paid in the industry” following an $11 million investment in line haul pay. Dependent on experience level and position, 60% of the driver force will enjoy pay increases anywhere from 5.3% to 25%. Evidently, they have the right idea: in an aggressive market, C.R. England is up over 200 drivers year over year, maintaining “first and foremost a competitive pay package” and adding guaranteed weekly pay, according to Harrison. While it’s difficult to make a definitive statement on how to best accommodate the driver squeeze, it’s clear to see that each company will be taking a different approach in keeping the industry aggressive and appealing to drivers.